For patients seeking straighter, more aesthetically pleasing teeth, orthodontic treatment is often the most optimal solution. In some cases, however, the issue may not be significant enough to warrant braces or Invisalign®. For minor cosmetic concerns, patients can enhance their appearance with porcelain veneers. Today, our team at Windsor Dental Group in Windsor, CA will explore instant orthodontics and porcelain veneers, and explain how this cosmetic dentistry treatment can deliver dramatic results. Custom-crafted to fit your unique dental anatomy, veneers are thin but durable fabrications that adhere to the front surfaces of the teeth. Made from high-quality porcelain, veneers mimic the translucency of the natural teeth for a lifelike outcome. Generally, treatment with porcelain veneers can be completed in two office visits. The first appointment involves preparing the teeth for the veneers. Impressions will then need to be taken so that our dental lab can fabricate your veneers. This process takes about one to two weeks, so you will be provided with temporary restorations in the meantime. During the second visit, your doctor will place your veneers. Porcelain veneers are used to conceal minor aesthetic imperfections, such as cracks, chips, discoloration, and misshapen teeth. They can also change the size of a tooth, making it appear wider or longer where necessary for a more balanced and symmetrical smile. In most cases, veneers are placed on the teeth that are visible when you smile. Your doctor will work with you to determine how many veneers will be necessary to achieve the desired results. Why Is it Called “Instant Orthodontics”? You may be wondering why this treatment is referred to as instant orthodontics. 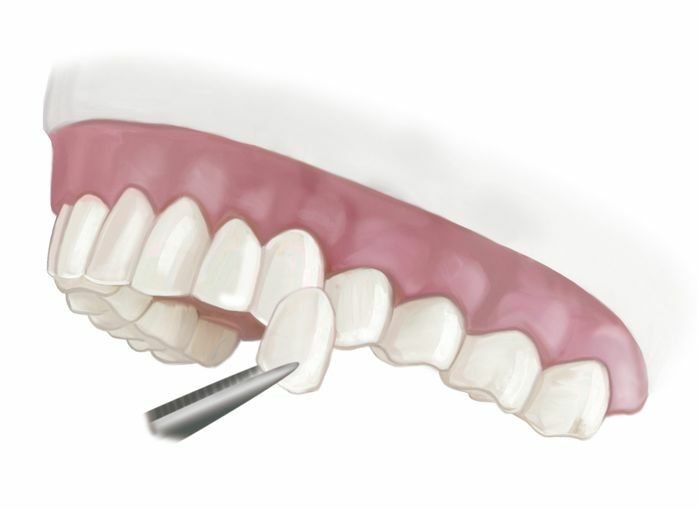 Veneers can also mask teeth that are slightly crooked or rotated. They are also commonly used to close gaps between the teeth and make slightly crooked teeth appear flush with the adjacent teeth. Because of these specific features, using veneers to address alignment issues is often referred to as instant orthodontics. Am I a Candidate for Instant Orthodontics and Porcelain Veneers? To be eligible for instant orthodontics, patients must be in good oral health. Therefore, if gum disease or tooth decay is an issue, these problems should be corrected before pursuing any cosmetic treatment. Patients should also have a full understanding of the treatment process and realistic expectations for the outcome. While instant orthodontics is an excellent option for some patients, it simply is not right for everyone. Specifically, individuals with moderate to severe orthodontic issues should consider braces or Invisalign, as they will be better suited for these options. In addition, porcelain veneers are for aesthetic purposes only. Therefore, if your misalignment is affecting your bite function, jaw joints, or comfort level in any way, then this treatment is not recommended for you. Those who suffer from bruxism, or teeth grinding, will need to undergo a thorough assessment before determining the most appropriate treatment. Severe clenching or grinding can damage your veneers and compromise your results. Therefore, a custom night guard may be recommended to protect your teeth from excessive pressure. If you are dissatisfied with the aesthetics of your smile, you could qualify for instant orthodontics. To learn more about cosmetic options in dentistry, or to schedule an appointment at our practice, contact us online or call us at (707) 838-3363.